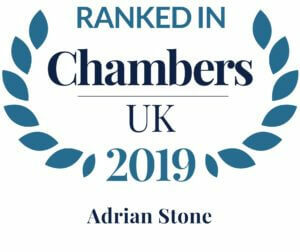 Adrian is a Senior Associate and manager of the Personal Injury and Medical Negligence department. He joined the firm in 2011 and has been a qualified solicitor since 1986. Adrian specialises in head injury, spinal injury, fatal accidents and other serious accident claims, whilst also managing his own workload of complex clinical negligence claims. He is recommended in the Legal 500 and is a member of the Law Society’s Specialist Personal Injury Panel and an APIL Litigator. Adrian (Stone) I mean it when I say it is always a pleasure to work with you: your thoroughness + attention to detail make it a much easier task than it otherwise would be.